I saw the “Tea Light” candle so I made my own with the supplies I had. I have added pictures for the each of the steps so it would make sense to you. To make the rose petals and leaves, I used Spellbinders Nested Hearts Dies – S4-296 Die #1; Heartfelt Creations Distressed Leaves PreCut Set HCPC 3376 Die #3; and Shapeabilities Nested Leaves S4-321 Die #3. 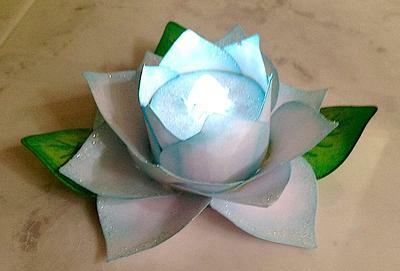 A ½ sheet of white cardstock will make enough flower petals for 1 Tea Light. Using ”White cardstock” Punch the 3 circles: 2 – 1 3/8” plain circles and 1-1 ½” scalloped circle. Punch another 1 3/8” circle out of scrap paper for a template to go over the flame. Fold it in 4ths, open and cut a ½” circle out of the center. Lay this template over the back of one the 1 3/8” circles and trace the ½” center circle from the template onto the back of the circle. Remove template and use an X-acto knife to cut slits in the ½” circle. The slits will allow the ½” circle to go over the light. Layer 1: Roll the all the petals and leaves up using a stylus or brush handle to give them dimension. Layer 2: Take 1 of the 1 3/8” circles, turn sponged side face down and place “Red Line Tape” at each 4th. Turn circle face up and adhere 4 petals so the rounded end is on the bottom and the petals sit on the top edge of the circle. Push the petals up more than the layer 1. Adhere Layer 1 and 2 together. Layer 3: Take 6 petals: Cut off the small rounded end. Roll these petals around a pencil so they will curve around the tea light base. Add Red line tape to the bottom of the edges. Adhere the petals so that the bottom edges are not below the base of the light. The sides of the petals will overlap and stand straight up. Layer 4: Curve 4 petals around stylus. 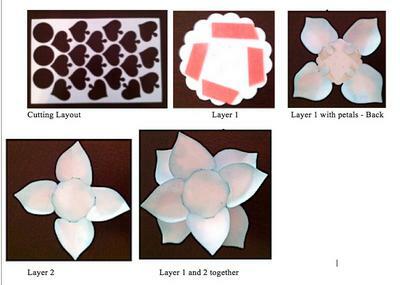 Add red line tape on the right side of the petal as shown in pictures for Layers 4-5. Adhere evenly to the bottom of the Tea Light. Be sure not to cover the switch on the bottom of the light. Layer 5: Cut 4 nested leaves using Die #3. Shape leaves. Adhere around the bottom of the light as shown. Thank you so much for informing us how you made your Tea Light Rose. I am going to keep your instructions and make them for Christmas with my great grand children, they are brilliant. Hi Emlie. You've just made a Lovely replica of a tea light vase that I have in a red metal. How clever are you!! Thank you for all your detailed instructions and photos. That took a lot of work, but it certainly paid off. It's BEAUTIFUL!! Enjoy a fabulous crafting day!